My take on this classic French dish from Burgundy, along with a few tips for making this stew as flavorful as possible. When I started this blog, I thought it would be kind of fun to post a few of the most successful dishes to come out of my kitchen. Part kitchen time capsule, part memory augmentation experiment, I didn’t expect I’d ever have so many dishes to write about. But 8 years, 4 kitchens and over 800 dishes later, I have a longer to-make list than ever before and there’s no end in sight anytime soon. Still, I’d kind of come to accept that I’d covered the classics about 400 posts ago and I was a bit surprised when a reader emailed asking why I didn’t have a Boeuf Bourguignon recipe. 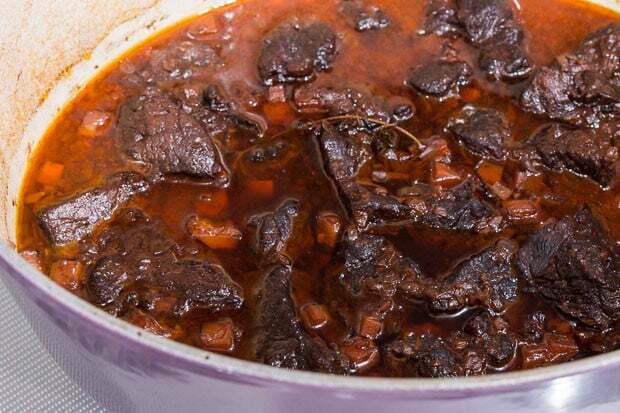 Well as of today, that oversight has been solved, and to the astute reader who pointed out the gap, I give you my thanks and my Boeuf Bourguignon. I mostly stuck to the classic preparation (you know what they say about fixin’ stuff that ain’t broke), but I’ve made a few small changes that eke out a bit more deliciousness from an already stellar dish. As with any stew, the trick to developing a full-flavored Boeuf Bourguignon is to brown EVERYTHING, and when I say “everything” I don’t just mean the stuff in the pan, but the stuff on the pan as well. This crusty brown stuff is called “fond” and there’s really no other way to describe it other than to say that it’s the concentrated essence of everything that is good and savory in the world. If you’ve been reading this blog for long you’re probably sick of hearing me say “Maillard Reaction”, but it’s this magical reaction discovered by a Frenchman that’s responsible for taking a few simple ingredients and turning them into this lavishly flavorful dish. While it’s pretty common to use a cut like chuck for Boeuf Bourguignon, I like taking this dish back to its peasant roots by using a cut of meat that’s inedibley tough unless it’s braised for hours. Beef shank comes from the legs of a cow and is a bit like a cold piece of rubber when it’s undercooked. That’s because it contains some of the most well exercised muscles on a cow along with a plethora of sinewy tendons. The thing is, shank meat is also one of the most flavorful cuts of beef for the very same reasons that make it so tough. To unlock this flavor and make the shank edible, all you need is a little bit of time. A few hours will do the trick, breaking down the collagen from tough rubbery fibers into satiny smooth gelatin. After the collagen has fully converted into gelatin you’re basically left with a latticework of meat that’s suspended in a delicate gel. 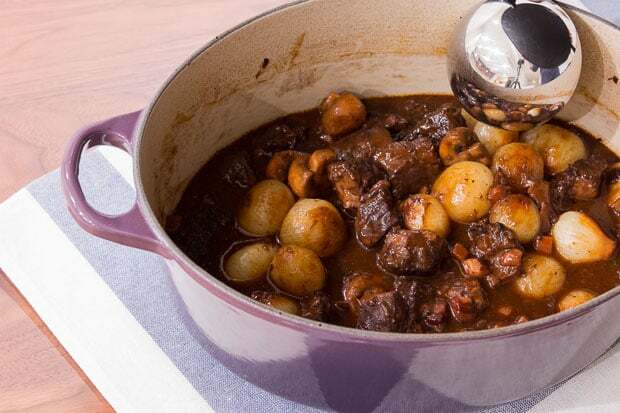 That’s why each bite of this Boeuf Bourguignon melts into a creamy bath of goodness in your mouth. 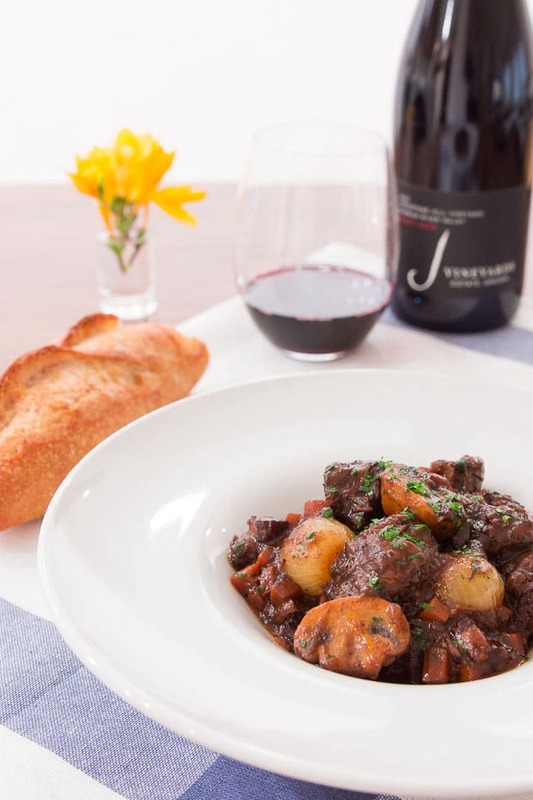 For the wine, I like to stay true to Boeuf Bourguignon’s roots by using a relatively full bodied burgundy or pinot noir. 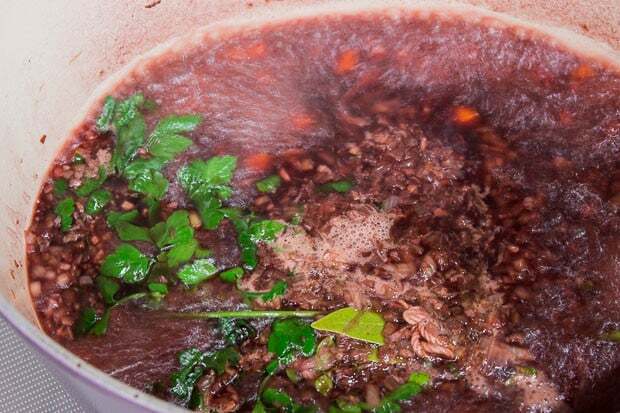 As the dish cooks down, the sharp acidity of the wine mellows as the flavors of the herbs, aromatics, pork and beef intermingle into a fond fueled bath of umami. Because the flavors are so well integrated by the end of the 2+ hour cooking time, I like to hit it at the end with some caramelized mushrooms and pearl onions as well as a shot of brandy. By adding these towards the end, it doesn’t give the ingredients enough time to average into the stew, creating some fresh layers of texture and flavor that add some stimulating variation into each bite. If your beef is very wet you'll want to use paper towels to dry each piece or the beef will not brown. Once the beef is dry, generously salt and pepper it. Arrange the parsley, thyme and bay leaf into a bouquet and tie them together with a food-safe string. This makes it a lot easier to retrieve when the Boeuf Bourguignon is cooked. Add the pancetta to a heavy oven-safe pot with a lid (such as a Le Creuset) and place over medium heat. Let the pancetta brown on one side and then flip and brown the other side. 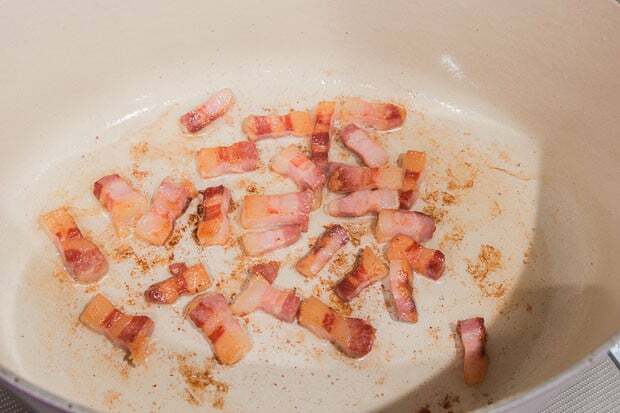 Transfer the browned pancetta into a bowl. You should now have a generous coating of oil in the pot from the pancetta but if there isn't enough add some vegetable oil. Add the beef in a single layer with a bit of space between each piece. 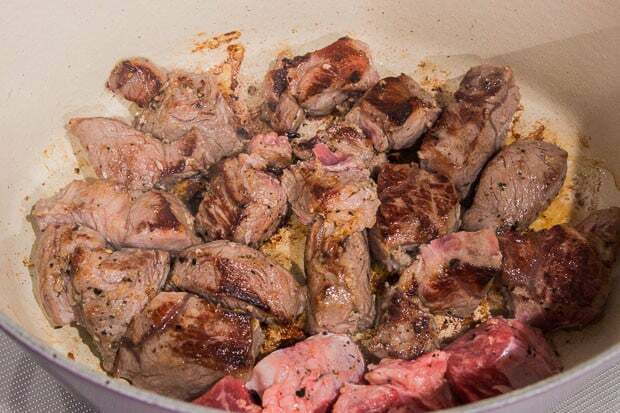 If you overcrowd the pan, the beef will simmer in it's own juices and will not brown. Do this in two batches if need be. Let the beef fry undisturbed, checking a piece periodically to see if it's browned. Once the beef has browned on one side flip it over and brown the other side. 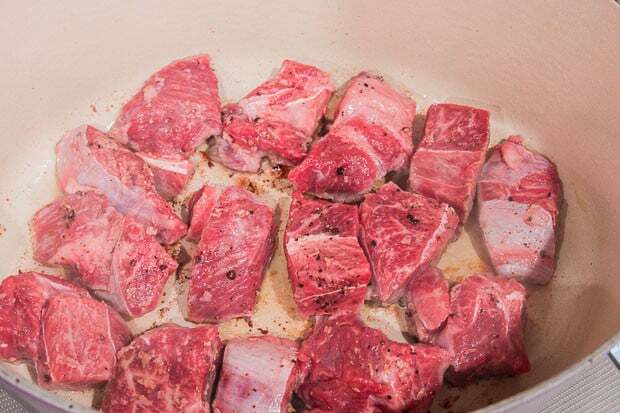 Transfer the browned beef to the bowl with the pancetta and repeat with the rest of the beef if it did not all fit in your pot. Add the onions, carrots and garlic to the pan and saute until the onions are tender and very fragrant. Use the steam from the onions to dislodge the coating of brown fond on the bottom of the pan. This brown coating is what gives our Boeuf Bourguignon it's spectacularly complex flavor and you want to make sure it doesn't burn to the pan. Add the wine, chicken stock, tomato paste, porcini powder and bouquet of herbs and bring to boil over high heat. Boil this mixture for about 5 minutes to burn off the alcohol. Return the pancetta and beef to the pot, cover with the lid and place the pot in the oven for 2 hours. 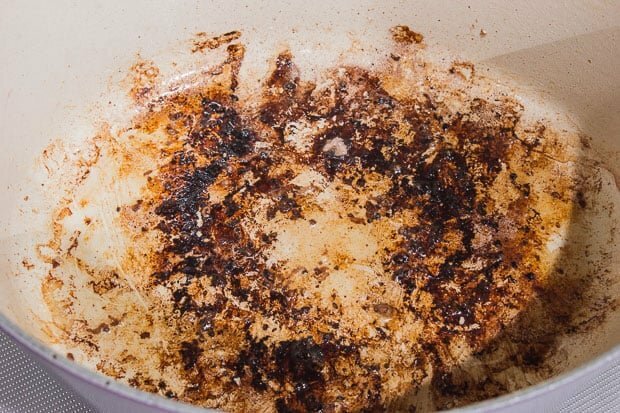 When the beef is done, remove the pot from the oven and skim off the fat into a frying pan. Add the onions and mushrooms and brown them over medium heat on one side before flipping and browning the other side. 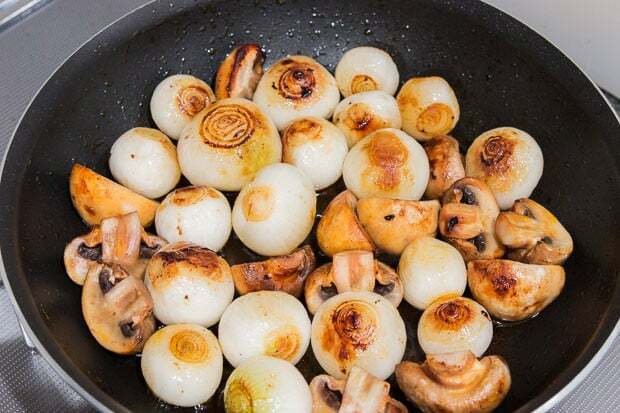 Use tongs to transfer the onions and mushrooms to the pot of Boeuf Bourguignon, but leave the oil in the pan. 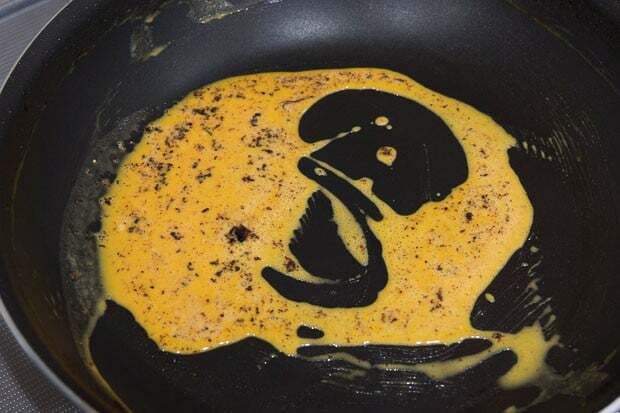 You should now have about 1 tablespoon of oil in the pan. If you don't have enough, add butter to make 1 tablespoon of fat. If you have too much, dump some out. Add the brandy and then put the pot of Boeuf Bourguignon on a burner on medium-low heat and simmer for about 15 minutes or until the onions are tender. 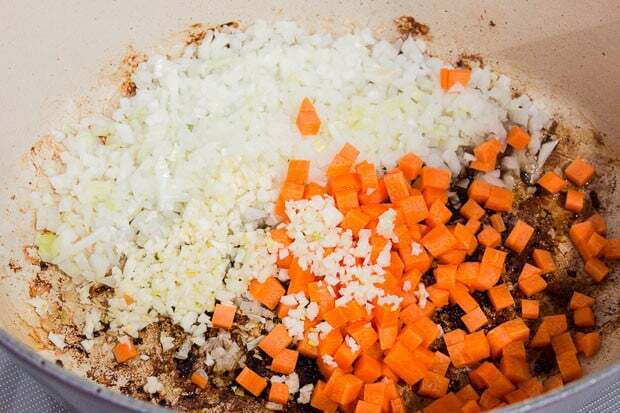 When the onions are tender, add the flour into the pan with the reserved fat and cook the roux, stirring constantly until there are no lumps remaining (1-2 minutes). 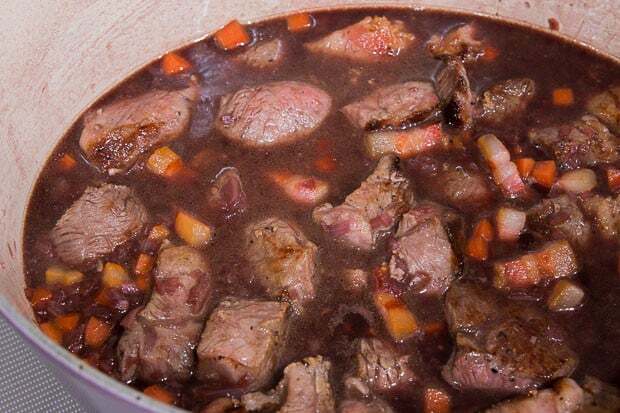 Pour the roux into the Boeuf Bourguignon while stirring to thicken the sauce. Garnish with minced parsley and serve with a crusty baguette. Porcini mushroom powder is a great way to add a little extra oomph to sauces and stews such as this, it's also usually cheaper than buying dried porcinis but if you can't find the powder, you can either grate dried porcinis on a microplane or throw a few in a spice grinder and powderize. my mouth is watering. thank you! Just made this, Marc, and it was heavenly! Luscious, deep and complex. Thank you! Hi bmorte, you’re very welcome! I’m so glad to hear you enjoyed this!